MidLife on Wheels: Finding my 'Inner Gatherer' .. Pine Nut Gatherer that is! Finding my 'Inner Gatherer' .. Pine Nut Gatherer that is! So I set out on this warm September morn to do some Pine Nut gathering. I had never really considered gathering pine nuts. My previous pine nut gathering experience involved going to the grocery store on special occasions when I could afford the $5 for the little bag of the precious nuts. Being a Burbite I never really thought about people out in the wilderness among the squirrels and critters actually harvesting pine nuts from the trees. That is, until my visit to the BLM office yesterday, where they had 3 inquires on pine nut gathering in 20 minutes. Not wanting to seem naive, I waited till the office was empty of visitors and inquired what the pine nut deal was all about. The lady gave me instructions, wrote down directions to where I should go and said this was a yearly event for her family. 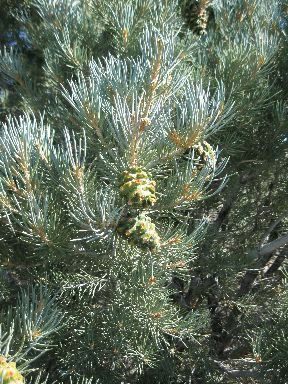 Finally when I had gone my ‘30 - 45 minutes from the last fork in the road’ I saw pine cones and stopped. I used gloves to pick with and put them all in my Trader Joe’s paper sack. To say Pine Cones are sappy is an understatement! The sap came through my gloves. I had it everywhere! The videos neglected to tell me to wear long pants to walk through scrub brush and to watch out for snakes and scorpions! Still I was feeling pretty good about being all ‘natural’ .. out in the wilderness gathering nuts for my dinner table. When I gathered all I could at this spot I moved up the road and stopped again to take a pic of a lone flower. This is where I met Tom. Tom was heading to town on his ATV and stopped to let me know I had missed flower season. 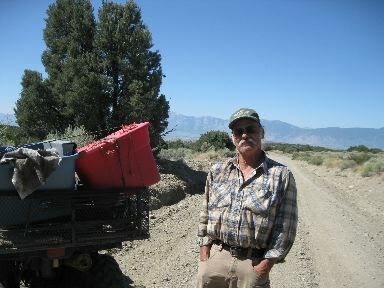 It turns out that Tom is a prospector who has lived ‘up in the hills’ in the area for 12 years. When I mentioned I was gathering pine nuts, he smiled slightly and told me I was “too early”. He expounded upon ins,outs and when of gathering. He looked in my bag and told me my pine cones, sappy though they were, probably hadn’t had time to develop any nuts yet! Noticing the sap on my hands, he had me rub my hands in the dirt then gave me a pair of his gloves so I could drive without getting sap on everything. He questioned me on back country survival knowledge & readiness, shared stories of the characters and misdeeds that occur ‘in the hills’ and along with his warnings, gave me directions to a spring where I might be able to find some flowers. Feeling a little deflated and not finding the spring amidst a myriad of unmarked roads, I picked a few more cones that looked ‘more done’ and headed home. The sap was beginning to be quite annoying. It was on both hands, in the crux of my arm and having moved my hair back more than once, I had clumps of hair sticking together as well! I am sure I looked like a flunky pine nut gather. My native american ancestors I’m sure are appalled! Even after a shower and sponge scrub down I am still finding patches of sap!! 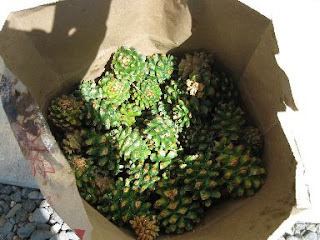 I have my pine cones in my bag in the sun where they are suppose to stay for about 10 days.. then I am suppose to try and extract the nuts ......if mine even have any nuts. So much for finding my ‘inner gatherer’. I don’t think I will even attempt the hunter part! $5 for 3 oz of nuts? ... Sounds like a bargain! Follow up: Indeed my Pine cones just oozed sap & turned brown. I harvested one unedible pine nut! Trader Joe’s here I come. Would you like to harvest with us in 2012? 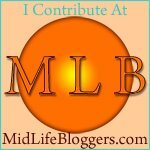 Great post and I would like to repost it on my blog, http://www.pinenut.com/blog. We would love to invite you to join us for the pine nut harvest. Our commercial harvest is rather a community affair and are welcoming of good spirits.